Patello-Femoral Replacement is a more conservative type of partial knee replacement that is designed to replace just the area under your kneecap – the patello-femoral compartment – while sparing the rest of the knee. Your doctor may determine that patello-femoral replacement is right for you if your patello-femoral compartment is significantly arthritic and your other two knee compartments are healthy. Standard off-the-shelf patello-femoral implants have been available for many years. These off- the-shelf implants have a fixed shape and are available in a limited number of sizes. Results with these implants have not been as consistent as many surgeons would like. After trying off-the- shelf patello-femoral implants, many surgeons reverted to simply using a total knee replacement. The KineMatch Custom PFR was developed as a better solution for patients suffering from isolated patello-femoral disease. What is the KineMatch Custom PFR? 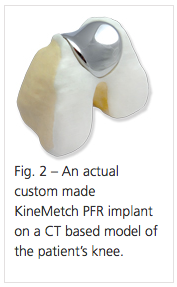 The KineMatch Custom PFR is a custom made implant, designed and fabricated to fit your knee and only your knee (Figs. 1 & 2). While off-the-shelf implant designs come in several sizes and are “fit” by cutting your bone to match the implant shape, the KineMatch Custom PFR takes the opposite approach by using a CT scan of your knee to create a virtual computer model of your knee and to fabricate an implant that fits your knee without cutting away your bone. This custom solution provides the opportunity to optimize the biomechanics of your knee. Not all patients with arthritis of the knee are candidates for this particular implant – it depends on where the arthritis is located in your knee. If you have been diagnosed with isolated patello-femoral arthritis, you may be a good candidate for the KineMatch Custom PFR. Partial knee replacement with the KineMatch Custom PFR is covered by most insurance plans. The knee is comprised of three separate compartments or portions where one bone articulates or “slides” against another. One or more of these compartments can be affected by arthritis. The joint between the femur (thigh bone) and the tibia (shin bone) has two articulations – the medial (inner knee) compartment and the lateral (outer knee) compartment. The third articulation in the knee is called the patello-femoral compartment – it is the joint formed by the front of the femur and the patella (kneecap) as it glides up and down the front of the femur while we walk, run, climb stairs or just get up from a chair. 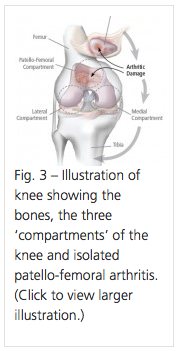 The three compartments of the knee are shown in Figure 3. Arthritis can be isolated to any one of the three compartments or can occur in two or three at the same time. If your arthritis is isolated to the patello-femoral (kneecap) portion of the joint and is severe, you may be a candidate for patello-femoral replacement. 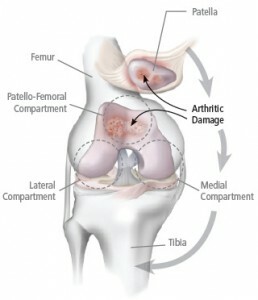 Your doctor can examine your knee and determine if your knee arthritis is isolated to the patello-femoral compartment. Data published in peer-reviewed medical literature demonstrate the effectiveness of the KineMatch Custom PFR for patients who have been followed for a mean duration of 11 years1,2. The results achieved with the KineMatch Custom PFR are significantly better than results with similar off-the-shelf implants. 1 Sisto (2006) Custom Patello-femoral Arthroplasty of the Knee. Journal of Bone & Joint Surgery. Volume 88-A. Pages 1475-80. 2 Sisto (2010) Custom Patello-femoral Arthro- plasty of the Knee: An Eleven Year Follow-Up. Presented at the Orthopaedic Research Society annual meeting. Surgeons using the KineMatch Custom PFR note that their patients typically recover more quickly and experience less post-operative discomfort than total knee replacement patients. This can be attributed to the greatly reduced removal of bone, the significantly reduced surgical trauma, and the preservation of the medial, lateral, and cruciate structures of the knee. In addition to reduced pain and post-operative swelling, this leads to less post-operative physical therapy and an earlier return to function and daily activities. Is the Custom PFR right for me? Dr. Sisto will be able to determine the extent and location of your osteo-arthritis to determine if the KineMatch Custom PFR is appropriate for you. A clinical exam and careful review of your x-rays, MRI scans, and arthroscopy images will determine the extent and location of the arthritic damage to your knee. If you and Dr. Sisto decide that you are a candidate for custom PFR, then you will be asked to undergo a CT scan of your knee. The CT scan itself takes about fifteen minutes. Your CT scan digital data will then be sent to Kinamed for manufacture of the implant. Your custom made PFR implant will then be ready for your surgery in approximately six weeks. The surgery typically takes about an hour. In most cases, you will spend one night in the hospital after surgery. Your surgeon will probably want you up on your feet with the aid of crutches later during the day of the surgery and you will go home with the crutches. Most patients typically need the crutches only for a short while and are able to discontinue them more quickly than total knee replacement patients. Your post- operative recovery and physical therapy will be dependent on the extent of your pre-operative disability. Ask Dr. Sisto if patello-femoral replacement is right for you!